Everyone deprived of their liberty has the right to clothing that is adequate, appropriate to the season, and does not humiliate or degrade. However, research into fashion and clothing suggests that rather than just being mere fabric to cover us up and keep us warm or cool, clothing can be significant for our sense of self and dignity. This blog is a summary of desk research into practices surrounding the use of prison clothing around the world and asks the question whether penal policy-makers and prison administrations should take a broader look at the impact of their clothing policies. While prisoners (mostly) do not wear the striped convict uniforms popularised by visual media over the last century, what they do wear is as varied as prisons themselves. In the worst cases, prisoners may have neither a uniform nor a clean set of clothes. 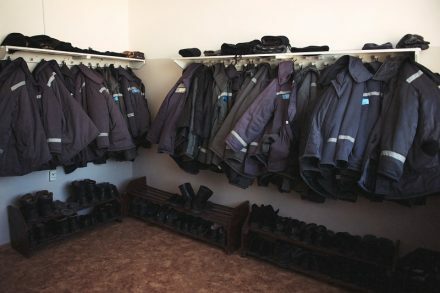 In some countries, uniforms are often similar to medical scrubs in style. In others, uniforms may not be dissimilar to casual wear outside prison (in the UK, male prisoners wear grey/blue jogging bottoms, t-shirt and sweatshirt, for example). In a few countries, prisoners do not have to wear uniform at all (eg. France, Poland ). Prison-issue clothing can be uncomfortable and ill-suited to the climate. In Florida, for example, death row inmates wear ‘bright orange scrubs made of some hot, heavy, itchy fabric’ . In Russia, women prisoners must wear traditional headscarves throughout the hot summer months. What type of uniform prisoners wear may be determined by their status, the length of their sentence, their offence, and even in one extreme case, by their ‘victim potential’. So why does it matter? After all, prisoners are habitually deprived of many comforts during their imprisonment – surely a choice about what to put on in the morning is one of the least of them? There are, however, a number of reasons why this topic deserves further consideration. The obligation to ‘respect prisoners’ inherent dignity and value as human beings’ is at the centre of a human rights approach to prison management. In relation to clothing, all international and regional standards say, in so many words, that prison clothing should be ‘in no way degrading or humiliating’. Access to laundry facilities and clean clothes is a problem in many countries. Where prisoners rely on their families to bring them essentials or to take their laundry away to wash, those without family nearby have no means to get clean clothes. Where there are laundries, prisoners have found that they do not get their ‘own’ underwear returned to them . How prison uniform can be used to shame the wearer has long been understood, and is even on occasions used in that way today. In another extreme case, in Maricopa county, USA, prisoners convicted of drink-driving must wear a (pink) t-shirt declaring ‘clean(ing) and sober’ and others slogans such as ‘meth user’. While, no specific research has been done (to our knowledge) with prisoners, the links between the wearing of prison uniform, a sense of self and self-esteem, and consequently with rehabilitation have been noted . This should really come as no surprise. The very introduction of uniform for prisoners in the second half of the 19th century in the UK had much to do with the contemporary belief that ‘the order and control of prisoners’ lives would lead to self-evaluation and subsequently rehabilitation’ . However, broader research into fashion and clothing and theories about how they link to identity, behaviour and even how we think and feel may also provide food for thought for those interested in the effective management of prisons and the rehabilitation of offenders. The link between clothing and identity is a long-established topic of research. Clothing has been linked to the formation of class identity and gender, for example. The French theorist, Roland Barthes, conceptualised clothing as a communication tool – a linguistic code – which we use to send out messages about ourselves. Others have emphasised its role in the process of a person’s self-realisation and presentation . How uniform can affect our behaviour in different contexts has also been the subject of research. In schools, uniform has been found on the one hand to reinforce rivalries, but also to foster hard work and self-esteem. Then there is ‘enclothed cognition’ – the idea that what we wear can change how we think. One experiment in 2012 found that students wearing a white lab coat made half as many errors in a test than those wearing street clothes, demonstrating heightened powers of attention. Another recent study at California State University found that students in more formal clothing (eg. a suit) were able to ‘think more broadly and holistically, rather than narrowly and about fine-grained details’. Other research shows how our clothes reflect our mood and can change it. For example, while far from the world of prisons, one researcher has found that women are more likely to wear jeans when feeling low or depressed. While none of this enables us to say – prison uniform is good, or prison uniform is bad – it does suggest that people who devise clothing policies for prison systems might consider this issue more broadly – with terms of reference that take into account both prison management needs and creating an environment that promotes self-esteem and independent living, with a view to a successful return to the community at a future date. Finally, for pre-trial detainees – a group which should be permitted to wear their own clothes according to international standards – whether or not they have to wear a uniform to court hearings could be a deciding factor in whether they will have to wear a prison uniform in the future. Many jurisdictions recognise that a defendant attending court in a prison uniform or other prison paraphernalia (such as handcuffs or shackles) has the potential to prejudice a judge or jury, with the US Supreme Court ruling in 1974 that it the wearing of a prison uniform ‘creates an unacceptable risk that the jury will impermissibly consider that circumstance in rendering its verdict’ . China’s Supreme People’s Court ruled in early 2015 that courts will in future be forbidden from bringing defendants to trial in prison garb to ‘avoid prejudicing legal proceedings’. However, in some countries defendants, the practice continues, including for example, the USA, Cambodia and Thailand. ‘Requiring an unconvicted prisoner to wear a prison uniform during the period of investigation and trial inflicts shame or insult on the unconvicted, which may result in his/her psychological passivity leading to insufficient exercise of the right to defence. As this, therefore, may impede the discovery of the whole truth about the case in question, imposing the prison uniform on the unconvicted cannot be justified, regardless of any justification for the imposition, including prevention of possible escape attempt’. Ash J, Dress behind bars: prison clothing as criminality, 2010. Correspondence with Michael L. Radelet, Professor of Sociology, University of Colorado. Ash J, Dress behind bars: prison clothing as criminality, 2010, p133. See for example, ‘Thinner porridge: a foolish attempt to standardise the rewards system in prisons’, The Economist, 4 May 2013; and ‘Private prisons allow inmates to wear their own clothes … to improve their self-esteem, The Daily Mail, 11 October 2011. See also: UK Prison Service Order Number 4800, Issue No 297, 28 April 2008. See Ash J in Dress Behind Bars, op.cit, p28. See, for example, Julia Twigg, Clothing, identity and the embodiment of age, 2009. Estelle v. Williams, 425 U.S. 501, 505 (1976). Photo: Karla Nur for PRI, Kazakhstan. Harriet is PRI’s Information and Communications Officer.